Did tweet by former MLB All-Star Curt Schilling advocate violence toward journalists? Former Arizona Diamondbacks and Boston Red Sox pitcher Curt Schilling placed himself in the center of controversy once again Monday when he posted a tweet that seemed to advocate violence toward members of the media. 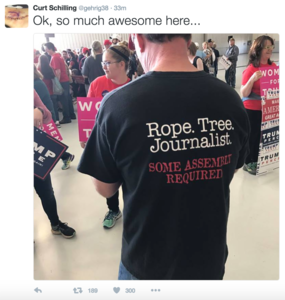 Schilling, who is supporting Donald Trump for president, posted this photo of a t-shirt worn by a man at what appears to be a Trump rally. The photo, which went viral on Monday, features a man wearing a shirt that reads: "Rope. Tree. Journalist. Some assembly required." As of Tuesday morning, the post no longer appears on Schilling's Twitter feed. Schilling, 49, is an outspoken conservative. In October, he announced his plans to run against Massachusetts Democrat Elizabeth Warren for the U.S. Senate in 2018. Schilling pitched in 20 MLB seasons. He was a six-time All-Star selection and won three World Series championships -- with the D-backs in 2001 and with the Boston Red Sox in 2004 and '07. He was fired from his analyst job at ESPN in April for a Facebook post that criticized transgender individuals.